You can’t imagine life without your hamster Buttercup. This furry little girl is full of charm and personality, and you could sit and watch her for hours. Buttercup has enjoyed a run of good health ever since she joined your family. She gets groomed daily, giving her hair coat a nice rich sheen. Buttercup also eats a top-notch diet, and her gastrointestinal system continues to work without a hitch. Even though Buttercup enjoys good health right now, you know she can pick up an infection or other illness without warning. That’s why your Waterloo veterinarian regularly examines little Buttercup to make sure she stays healthy. Perhaps little Buttercup has been sneezing a lot, and you’ve also noticed that she seems to have some difficulty breathing. Even more apparent, Buttercup has some reddish leakage from her eyes and a bit of nasal discharge. Buttercup has to be the most fastidious hamster you’ve ever met. Even with her high cleanliness standards, though, she’ll probably pick up some external parasites at some point. Since you look at Buttercup every day, you’d see that she’s dropped some hair and seems to be scratching a lot. You might even see some distasteful lice running through Buttercup’s hair coat. Good thing your vet can get rid of those lice, or any other external parasite, with an effective targeted medication. Buttercup has a hearty appetite, often eating every bit of food you give her daily. In appreciation, Buttercup makes nice normal-looking deposits where you can easily find them. If she begins to dribble, or goes into full-fledged diarrhea, get her to your vet quickly. With Buttercup’s delicate system, you don’t want her to become dehydrated. 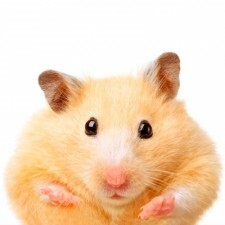 You might be surprised to learn that pocket pets have dental problems, too. While Buttercup’s appetite is fine today, if she doesn’t finish her meal or loses some weight, she might have poorly aligned teeth. Once your vet trims Buttercup’s teeth so they fall into their normal positions, she’ll return to her regular eating habits. Pocket pets, including Buttercup, can fall victim to tumors. Mice and rats, especially older pets, seem to have the highest risk. If you find a suspicious growth, lump, or mass on Buttercup’s body, get her to your vet immediately. While Buttercup has some health risks, your Waterloo vet’s regular checkups can give her the best chance for a comfortable life with your family.